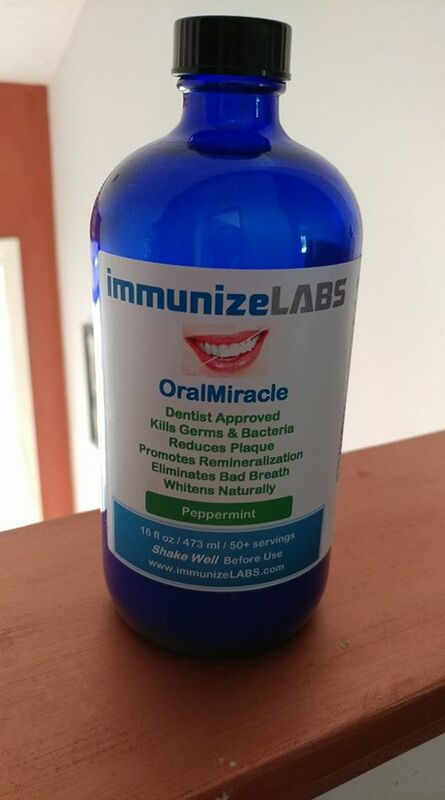 Oral Miracle is a remineralizing mouthwash…and so much more! I have had trouble with my gums for several years now, especially after getting sick a second time with CFS in my mid thirties. I have been seeking solutions ever since. It’s a long story, but due to increased sensitivity within my whole body, I was unable to brush my teeth properly for a while. As a result, I developed gum issues. I have always taken great care of my teeth, so this was initially very hard for me to realize…that my gums weren’t in the best shape anymore. However, I have been searching for tactics and products ever since to help me restore the health of both my gums as well as my teeth. I have been using Oral Miracle for a few months now. At first, it seemed too strong for me, as my teeth and mouth are quite sensitive. Yet, with repeated use, I adapted and I also noticed that the formula was helping to neutralize acid (and maybe bacteria as well) in my mouth. Yet, with repeated use, I adapted to the taste and ingredients, and I also noticed that the formula was helping to neutralize acid (and maybe bacteria as well) in my mouth. In fact, it works better than the usual pre-rinse I have been using. There is definitely something to the syngergistic ingredients in this product. I have not been using this product according to directions, as my teeth and gums are so sensitive. I have been using it as a pre-rinse, before I brush. However, I will try to use it more in line with the directions over time, as my teeth and gums get stronger. Spit out and do not rinse, eat or drink anything before bed. The coating left behind coats your teeth enamel enabling remineralization throughout the night! Scope: Helps with fillings, Halitosis, Tooth decay, Dental Caries, Toothache, Whiten Teeth, Gum Disease, Cavity, Sensitive Teeth. I will continue to use this product, as I have had good results thus far with neutralizing bacteria and improved gum health. This is a very good product and worth checking out, especially if you have any gum issues or tooth sensitivity or discoloration. Check out more information about this product here (from the website). Note, check out the reviews on this page link too! Scope: Who can benefit from OralMiracle? Anyone wanting to improve their oral health or looking for naturally whiter teeth, especially those with thinning tooth enamel, cavities, dry mouth, sensitive teeth, toothaches, mouth sores, bad breath, infected gums, discolored teeth, loose teeth, dental plaque, periodontal disease, and bad bacteria. Acid – When acidic foods, such as fruit juices, coffee, vinegar, chewable vitamin C, or carbonated drinks (soda pop), are eaten, the acids will etch the enamel off the teeth. Sugars – Stay away from white sugar. Sugar leaches out calcium from the teeth and bones. Adults can tolerate 2/3 of an ounce of sugar a day. Any additional amount is absorbed into the circulation and is converted into carbonic acid. To protect the body from the corrosive action of this acid, calcium is withdrawn from the teeth and bones for neutralization. Fluoride – Fluoride can deteriorate connective tissues by breaking hydrogen bonds. When one uses fluoridated toothpastes and other fluoride sources like fluoridated drinking water, the gums that hold teeth in place become loose and spongy resulting in gingivitis. When you combine fluoride with a dietary vitamin C deficiency, one develops a serious gum disease periodontal disease. Eliminating the intake of fluoride used as an additive in tooth pastes, gels, mouthwashes, and drinking water, increasing the intake of vitamin C and using OralMiracle to promote remineralization will gradually correct this condition. Fluorosis – The discoloration of teeth, is caused by an exchange of ions that takes place when food acids attack the surface enamel and leach out calcium and phosphorus from the teeth. If the calcium and phosphorus are replaced by ions of other metals such as iron, copper, etc., then discoloring and brittleness (mottling) of the enamel takes place. Oral Miracle has some really great ingredients too (I am big on ingredients…from my days working in the natural foods/products industry). The ingredients are some of the biggest players and factors in why this product works. Ionic & Colloidal Silver – Completely eliminates germs and bacteria without any side effects or burning. Hydrogen Peroxide – A natural antimicrobial that also whitens teeth. Calcium Phosphate + Phosphopeptides – CPP (Phosphopeptides) and ACP (Calcium Phosphate) spontaneously form CPP-ACP in saliva to help prevent & heal existing cavities by remineralizing teeth enamel. Pink Himalayan Salt – A natural disinfectant that also removes swelling from tissues. Contains 84 minerals that help remineralize teeth enamel. Non-toxic. Sanguinaria Extract – A natural plant extract that is antiseptic, antimicrobial, anti-inflammatory, and has antioxidant properties. Reduces dental plaque and gingival inflammation. Aluminum-Free Baking Soda – Raises your mouth PH to 8.0 because remineralization takes place at a pH of 7.5 to 8.5 in the presence of calcium and phosphate. Xylitol – Fights cavities by disrupting decay-causing bacteria from producing tooth-eating acid and the plaque they create. Can be used in children to prevent cavities. A recent study showed a dramatic 70 percent reduction in tooth decay among children. Organic Lemon Oil – A natural bleaching agent. A 2014 International Journal of Food Microbiology stated that lemon oil may actually be the most powerful anti-microbial agent of all the essential oils. Organic Lemon Juice – Whitens your teeth naturally. Organic Cinnamon Oil – Helps prevent dental cavities. Cinnamon oil has shown to be effective as a broad-spectrum antibiotic against 10 different species of bacteria that cause dental cavities. Organic Clove Oil – A powerful analgesic and antibacterial that is a natural alternative to Anbesol and Orajel. Very effective for relieving dental pain, tooth ache, sore gums and mouth ulcers. Cayenne Pepper Oil – Contains capsaicin which eliminates canker sores pain. Capsaicin is the main ingredient in many medicinal candies used to treat mouth sores in chemotherapy and radiation patients. Tea Tree Oil – An efficient antiseptic that kills bacteria fast and eases away pain you may have on your gums. Organic Peppermint Oil – Natural, clean, refreshing taste. Improves concentration and alertness. Aids in digestion. Organic Spearmint Oil – An antiseptic, antispasmodic, determinative, cephalic, emenagogue, insecticide, restorative and stimulant substance that also freshens breath. Myrrh Oil – Effective in treating gum diseases, sores in the mouth, helping promote oral health. I highly recommend you check out this product and give it a try! Healthy gums and teeth are always worth the effort!